Rian Johnson's The Last Jedi pleased fans who were looking for something a little bit different from the franchise, but those fans who wanted similar styles and adventures than they'd seen before were left upset. Some were downright angry. It is with the newest entry into the Star Wars canonical universe that the new Lucasfilm shows their hand on what they're going for with these different styles of film. The saga entries, with Episode IX on the horizon, are, for lack of better description, for the critics. The standalone films, the latest of which being Solo: A Star Wars Story, are for the fans. There isn't anything inherently right or wrong with either of these two types of films. They have different aims and different prerequisites by which to determine success. It should, however, be understood which of the two types of films you are in store for. Solo: A Star Wars Story is decidedly a film for the fans, one that works more off a nudge & a wink rather than an expansion of the universe many of us have already come to know and love. It's a film that is more interested in explaining ideas and character development that has already been shown than building towards something new. Ever wondered how Han Solo, played here by Alden Ehrenreich, came by his name? The explanation is in here. Curious about the Kessel Run, the notable maneuver Harrison Ford's Solo brought up in A New Hope? That's in here. Have you wondered how Han came to have a Wookiee copilot named Chewbacca or even why he is always referring to Chewbacca as Chewie? I know you're smart enough to determine how one is simply short for the other, but that is all explained away in detail in Solo. Again, heaping levels of snarkiness aside, there is nothing wrong with Lucasfilm wanting to put together these standalone stories/prequels that are more explanation of the familiar than wondrous discovery of the new. To that end, the constant winks and nudges at work in Solo are the biggest drawback one could find in the newest film. Outside of that, the film, with veteran director Ron Howard at the helm, is a blast of entertainment that breezes by without much effort. Howard was brought on board for the directing duties on Solo very late in the game. The duo Phil Lord & Chris Miller (Cloudy with a Chance of Meatballs, The Lego Movie, 21 & 22 Jump Street) were initially given the task and were very near completion when Lucasfilm decided to show them the door. Howard was brought in and re-shot anywhere from 75-85% of the film, essentially undoing the work the original team had completed. The Lord & Miller version of Solo was presumably far more radical than what Lucasfilm wanted to release, and Howard was brought in to give the film a more familiar look and a more tried-and-true feel. To that end, Howard's late-stage inclusion does just the trick. While the film has something of a slow start getting out of the gate, the adventure at its core delivers on the promise of uninterrupted excitement and wall-to-wall thrills. 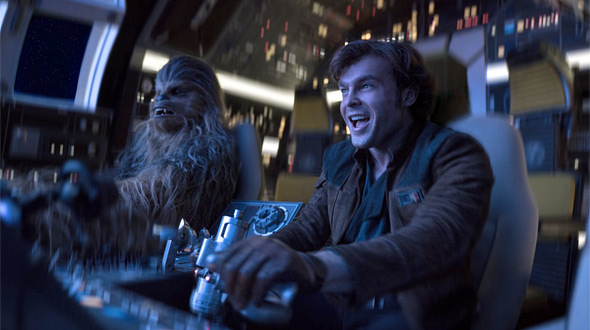 The screenplay from the father-and-son team of Lawrence Kasdan and Jonathan Kasdan has the feel of a heist movie, an idea that rides right along with Solo's character of a smuggler growing up within the galactic underworld. They still find countless opportunities for the high-octane adventure fans of the series will be clamoring for, though, and the film delivers an abundance of grin-inducing moments throughout. Entertaining as it is, though, the film struggles at times to find its place within the context of the overall, Star Wars franchise, the cast involved having difficulty sliding into these familiar characters. That's chiefly felt in the case of Ehrenreich who has the thankless job of trying to fill Harrison Ford's shoes as one of the most iconic figures in modern cinema. Ehrenreich smirks with all the required charm and you believe him as a brash, young scoundrel who's still looking for love in the galaxy. There's very little connection between the Han Solo found here and the one introduced back in A New Hope, though, and you have to wonder how much development in this character has been left for future, Solo-centric projects. Outside of the lead, the film's cast acts commendably even when the performers are seemingly given very little with which to work. Joonas Suotamo, who has filled the role of Chewbacca since The Force Awakens, does fine work here, and it's a nice surprise to finally see Chewie fulfill the promise of Wookiee physicality that's been hinted at for so long. Woody Harrelson and Thandie Newton are doing decent work, though their respective characters, new as they may be, are familiar and somewhat typical. Emilia Clarke, likewise, acts accordingly as Solo's love interest, but she's given little motivation or development. Paul Bettany plays the villain here, and he seems to have been given the least with which to work. The acting standout in Solo, though, has to be Donald Glover as the young Lando Calrissian, a smuggler who we know will eventually become good friends with the eponymous Solo. 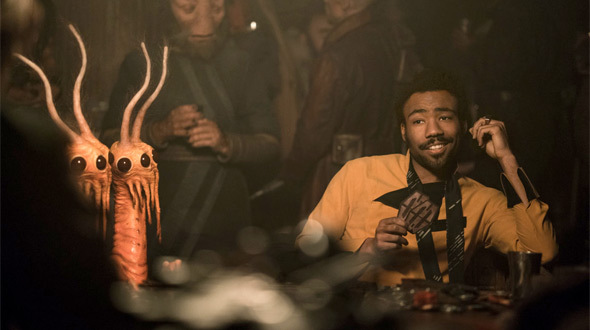 Glover has the mannerisms and speech down for his character, previously played by Billy Dee Williams, but even he seems to have been given the short stick in terms of screentime. Even when he's present in the film, there's a fear he'll be upstaged by Phoebe Waller-Bridge as the voice of L3-37, Calrissian's droid companion who is more than a little interested in the rights of droids across the galaxy. It's a playful character and one Waller-Bridge makes her own, but her presence is still short-changed for the sake of familiar. That is, unfortunately, where much of the enjoyment in Solo: A Star Wars Story rests, fleetingly and with the understanding that it could all be swept aside at a moment's notice for the sake of something with which we're already familiar. Entertaining enough but ultimately toothless, Solo is a bubble gum-soft adventure of relaxed storytelling and comfortable choices. It truly is, for better or for worse, a movie for the fans, and there's nothing wrong with that. It will be interesting to see where the future of the Star Wars franchise takes us and if that destination is any more challenging than discovering answers we've either already been made aware of or we weren't asking in the first place.